A 2 pack of Fine N Scale PRR x29 kits, and a Ghq PRR L1 conversion kit for a Kato Mike; I've always wanted to build one of these kits! A couple of hundred feet of ME Code 40 rail to go with my Nn3 tie bed and #4 turnouts. 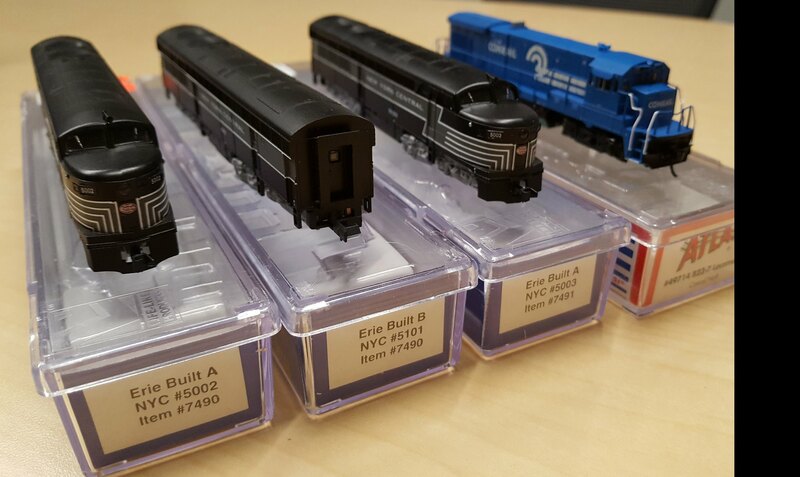 Just picked up a nearly-new A-B-A set of Life-Like NYC Erie-Builts and an Atlas Conrail B23-7. The B-boat fits in with my intended layout theme. The Erie-builts don't, but they were priced right compared to the unobtainium prices on The Auction Site That Shall Not Be Named™, and dang, thems is purdy! They'll look good next to my E-R NYC Sharks. Onizukachan, WPZephyrFan and Hardcoaler like this. Lightning Stripes ALWAYS Look Good, Wherever They Run. Just recieved a set of 4 locomotives, purchased from TB. 3 BN SD70's and an LMX 8-40B. All new, never run it looks, with DCC installed! of Mike Dannemans Moffat Road N Scale layout. Is one of only 60 cars produced! Picked up off everyone's favorite online auction site! And for this beauty to arrive, it’s a 79006S with the white LEDs and the Loksound. But I still wanted to share! I’m excited! I bought a bunch of stuff from Fifer, Streamline Backshop, Another shop, and EBay! 3x 11-214 LED kits from Japan with the warmer toned softer illumination LEDs to go with them. Got some 9g servos and ESU controllers, NCE light its for structure lighting (and maybe caboose marker lights? ), all the fixings to do weathering on rail and rolling stock, some switches, and so forth also. And some bullfrog snot to make sure I can pull 1:160 scale houses off their foundations. Hardcoaler, WPZephyrFan and tracktoo like this. Picked up a Micro-Trains B&O 40' boxcar,Clinchfield and Great Northern by deluxe Gulf by Bowser, and Frito-Lay Red Caboose or Intermountain covered hoppers. Thought $36 for all five was not bad. Also helps when have small layout on display to run on and free admission. 52 DCC decoders for Intermountain and Altas diesels... all.thanks to a bigger than usual tax refund. Onizukachan and mtntrainman like this. Went to Delmont, PA to visit The shops of Scenic Express. Had my list of what I wanted in hand but still managed to do some impulse buying. Okay, I did more than just 'some' impulse buying. Among other things, I got some Woodland Scenic static grasses, a couple of 'Eco Packs' of 'Super Leaf' scale leaves for all those cheap Chinese trees I've accumulated off Ebay and some more #50 light gray ballast. To top it off, everything on my list was in stock. A very nice experience for sure. drbnc and Onizukachan like this. Just got this lot, more heavily weathered than I would normally like for 1953, but... 20 cars for $10 a car shipped? You betcha. A little light weathering and dirt on my “fresh from the shop” new ones, and a little black wash to tone down these (except for Mr 1954 there in the bottom corner) and I can mingle them together well enough. WPZephyrFan, Hardcoaler, MK and 2 others like this. The Atlas code 80 #6 switches are really good. The ones with the blade-type points (USA-made? ), anyway. About the only commercial switches I have never had to tweak before installation. Rich_S and Onizukachan like this. That was a heck of a deal!!! Sort of wonder if the seller was not aware that 'weathering' is not bad thing... and priced it as if it would not be a desireable product for n scalers. I don’t know, no one else bid on them and there were watchers, so I guess they looked TOO weathered... or I got lucky. I was able to tone down some of the excess weathering on the trucks with black panel line accent, and remove the excess weathering on the overdone ones by rubbing with a little testors thinner on a paper towel. One of these is brand spanking new, the others came out of the above set and got toned down a bit... not a bad match. WPZephyrFan, Kevin Anderson and Hardcoaler like this. Not really a purchase but did happen upon 2 4ft x 8ft sheets of Owens Corning 2inch thick pink foamboard late yesterday. Going to be just the thing for a hopefully soon to be started 4x8 or smaller layout I'm planning. MK and Hardcoaler like this. Wow, right there is about $100+ for those two sheets of foam!